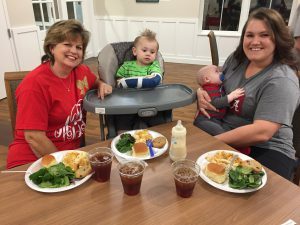 Michelle has to travel hours from Mobile to Birmingham for her son’s medical treatment. Read on to learn how the charity makes time away from home a little easier! What is it like going from someone who supported the charity to someone staying at RMHCA? I’ve known about the Ronald McDonald House for years, like since I was in my single digit years! My mother has always had us kids (there are seven all together) saving pop tabs. She would donate them to the families. So now that my family has been for using the House, my family is saving the tabs and I donate items regularly. Tell us a little bit about why your family found need to stay at the House. My family found need to stay because my son Brantley had Constraint Intensive Therapy (also known as C.I.) for three weeks straight and five days a week, three to four hours everyday. So it was easier to stay very close to the clinic we needed to be at every morning at 8 a.m., then to stay somewhere else. Your mother-in-law was able to stay with you and Brantley. What does it mean to you to be able to have extra family members at the House? It means the world to me. Even though Aaron, Brantley’s father, cannot be there due to his work he continues to support us in every way. But having a family member if not a few when we travel to better Brantley’s future is the world. Brantley also has behind-the-scenes family members that help us each trip. My parents make sure we have everything we need if not more. Our church family makes sure we have daily prayers for safe travels and for the continuous growth for Brantley’s future. Overall, what about the House makes life a little easier for your family? Being able to have somewhere to be able to have our own space, be comfortable and for my children to have their own toys. It makes it easier when we have to stay long periods of time I can bring John’s [my younger son’s] swing. What has it mean to stay here? It means the world to myself and my family that we have been able to stay. It has help tremendously with money and just in trying to find a place to stay. Its nice to stay in one space and have the benefit of being right in the middle of where we need to go, places to take my babies and places to eat when we don’t want to cook at the House. Does being around other families in similar situations help you? In what ways? Yes, being around other children that have similar if not the same injury Brantley has helped a lot. I have tried staying in touch with moms here in Mobile that have babies with the same injury. It’s nice to follow them on Facebook to share encouragements. And being around other families at the House helps in surprising ways. Brantley wasn’t feeling well while we were at the House and wasn’t reacting well to medicine the doctors had prescribed him. 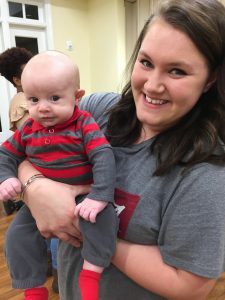 Another mom heard me talking to the doctor on the phone about it and when I got off the phone, she said her son had experienced the same issues and encouraged me to get another opinion from Brantley’s main doctor. She was right! Brantley got a new prescription and felt much better. So yes, it’s so beneficial to be around other families while your away from home. 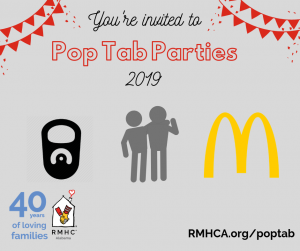 Ifsomeone had just learned about RMHCA, what would you suggest they can do to start helping families? First thing I would tell you is: save your pop tabs, donate them to the nearest House. Second off I would say go to your local RMH and became a volunteer to help with either preparing food for the families or help tidy up the House. We hope you enjoyed reading about Michelle’s stay at the House! Please consider making a donation, dropping off Wish List items, or volunteering to help keep families like Michelle’s together when they have to travel far from home for medical care.